Do you ever purchase something and then later think "wait a minute - I already HAVE this!" This happens to me all the time, which is why I have multiple grey cardigans, TOM's shoes and a trillion different lipsticks. Seriously, I probably have a 2 year backlog of lip products outside of the box of current lippies that I wear, which is why when I received the Annabelle Big Show Lip Shine in Dare last month, I felt deja vu. Some pawing away at my lip box revealed, yep, I have a dupe. Here I was thinking I was being daring and filling a niche in my lip collection with this beautiful (and award-winning) purple lip gloss from Annabelle, when it also happens I have a very similar color from Revlon's Super Lustrous in Berry Allure. So which is better? 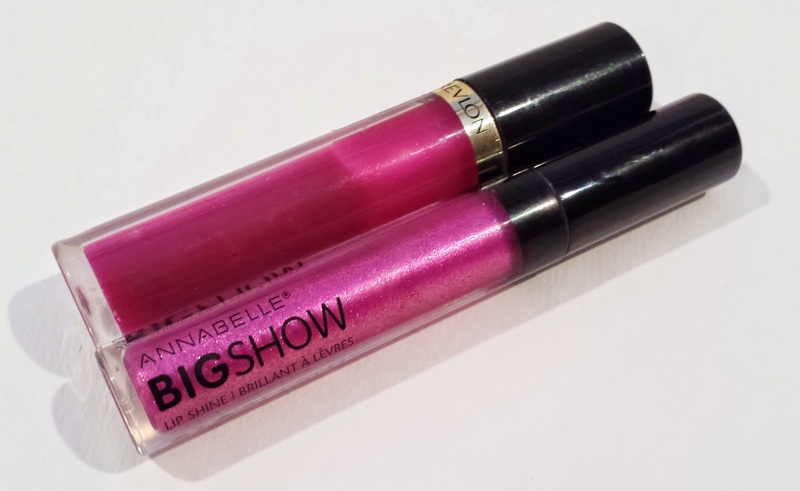 The Annabelle Big Show Lip Shine recently won the 2014 Elle Canada award for best lip gloss under $20. It's a non-sticky lip gloss containing reflective glitter to max up the glam. The Revlon Super Lustrous lip gloss (previously reviewed here) is a silky, non-sticky hydrating lip gloss. It is beautifully pigmented and long-wearing. The Annabelle is $9.95 while the Revlon is $5.99. Both are available at drugstores like London Drugs and both use your standard doe foot applicator with a twist-off cap. Both are also clear so you can see the color. Color: As you can see, these two colors are very very similar, except that the Annabelle contains light reflecting particles, giving it a bit more of a party feel. Don't worry, even though the tube looks really sparkly, you can only see the glitter up close. I love layering this gloss over a matter lip color as it just pumps up the color and shine. Pigmentation: Although both are better than most lip glosses in that the color payoff is pretty decent, the Revlon has the slight edge. The Revlon is quite pigmented and stains my lips a very pretty deep magenta whereas the Annabelle is much sheerer. Texture: Both of these glosses are non-sticky which is awesome! Lips feel moist and slick and dry down to leave your lips soft instead of dried out thanks to hydrating ingredients. The Annabelle gloss gets extra points for also containing antioxidants for a little anti-aging boost. Wear: The wear time on both these glosses is pretty decent at a few hours. I've worn both through meals and actually still had a slight stain leftover. The Revlon though wins this one as it leaves more of a stain on my lips. Revlon Super Lustrous - for just wearing solo, I prefer this one as it is cheaper, has greater color payoff and lasts longer. I'd still highly recommend the Annabelle Big Show though as it was a very very close second. Have you tried either of these glosses? What did you think?